Along with a college degree, training, and a general teaching exam, most states require beginning teachers to pass subject exams before they become certified or licensed to teach a particular subject. The Praxis Mathematics Content Knowledge exam evaluates the mathematical knowledge and skills necessary to teach mathematics to secondary school students. 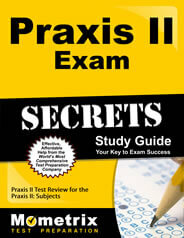 The Praxis Mathematics Content Knowledge exam is a computer-based exam. You will be given 150 minutes to take the exam. You will have time before the exam begins to become familiar with how to use the computer system. Accommodations are available for test-takers who meet ADA criteria. You must request accommodations and receive approval before you can schedule your exam. Your score is based on the number of correct answers. Since there is no penalty for an incorrect answer, you should try to eliminate any incorrect answers and guess at the correct answer. There are 60 questions including multiple choice questions. For other questions you might be asked to type in a written or numerical answer or to drag-and-drop content to indicate the correct answer. You will choose your exam location from among an international network of testing centers. Exam schedules vary by center. You will need a valid and acceptable form of photo identification. Personal items such as purses, backpacks, water bottles, pen, pencils, and notebooks are not allowed in the testing center. You may not bring cell phones or any other electronic, photographic, listening, or recording devices. For this exam, an on-screen graphing calculator is provided. You should download the 30-day trial calculator and tutorial to practice using this calculator before your exam day. You should learn how to use the calculator for basic arithmetic operations and calculations such as exponents, roots, trigonometric values, and logarithms that you will need for the exam. What is the Exam Content? The exam questions are distributed across the following content domains. The exam is designed to evaluate how well you are able to integrate mathematics knowledge. Therefore, some questions will involve more than one competency and may involve competencies from multiple content categories. What Does My Score Report Mean? Individual states and organizations set their own requirements for passing scores. Your score report will include information on passing scores for your state. If you move to a different state, your score will be transferable but the exam and score requirements may be different. You’ve worked hard to get to this point. Passing the Praxis mathematics content exam may be the final capstone you need to become a certified math teacher. You certainly don’t want to take the exam without first preparing as best you can. The test preparation experts at Mometrix have created the study tools you need to help you cross the finish line. 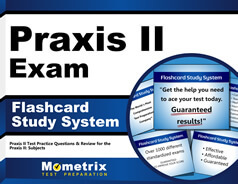 The Praxis Exam Secrets Study Guide and the Praxis Exam Flashcards with practice test questions are carefully researched and written to guide you to success on exam day. By using these tools together, you will strengthen your knowledge base, practice essential skills, learn valuable test-taking strategies, and gain the confidence you need to successfully demonstrate your abilities on exam day.